The recommended servings for fruit and veggies is 5-9 servings per day. This can be hard to get if you don’t start early! Especially for kids whose tummies don’t hold very much food at a time. 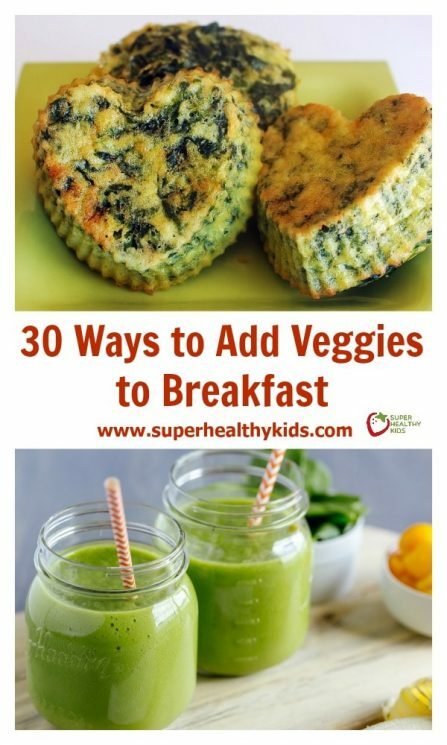 Usually we think of having fruit with breakfast, but there are a lot of delicious and satisfying ways to get veggies in at breakfast. 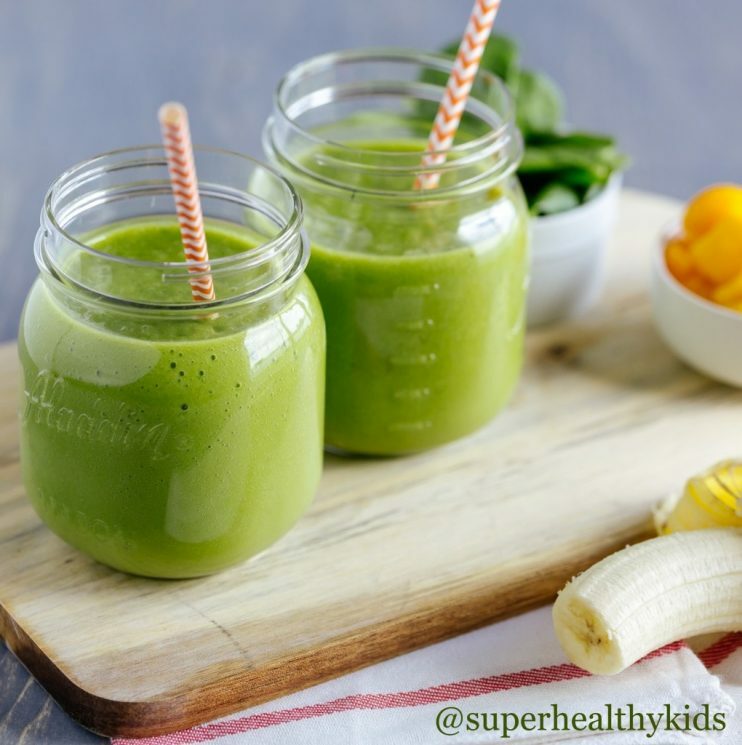 Starting your day off with some veggies not only add a lot of nutrients, but can be more filling to keep kids from getting hungry until lunch. 1. Breakfast Tortilla – spread with cream cheese, favorite veggies and salsa. 2. Finely chop spinach and add to scrambled eggs as they cook. 3. Hardboiled eggs pair deliciously with sliced tomatoes. 4. 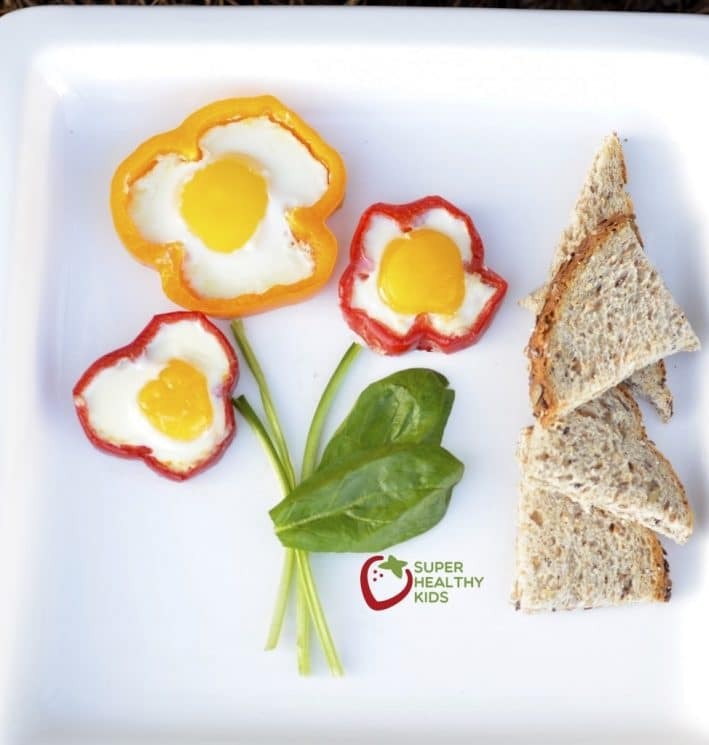 Cook an egg in a bell pepper to make a flower shape. 5. Smear a tortilla with bean dip then add chopped or sliced tomatoes and shredded low-fat cheese. Warm the burrito in the microwave for 30 seconds or until the cheese melts. 6. Make a breakfast casserole and add in veggies. 7. Place 2 tablespoons of peanut butter in a small container then dip with a mix of celery sticks, cucumbers, and apple slices. 8. Mix plain Greek yogurt with a drizzle of honey as a dip with carrots and whole-grain pretzel sticks. 9. Scoop salsa onto an English muffin topped with avocado and turkey bacon to make a hearty breakfast sandwich. 10. Make a breakfast tostada by layering a few black beans, cheese, favorite veggies and salsa on a corn tortilla. 11. Add sauteed spinach or kale to an open-face egg sandwich. 12. Add finely chopped broccoli and cauliflower into a quiche. 13. 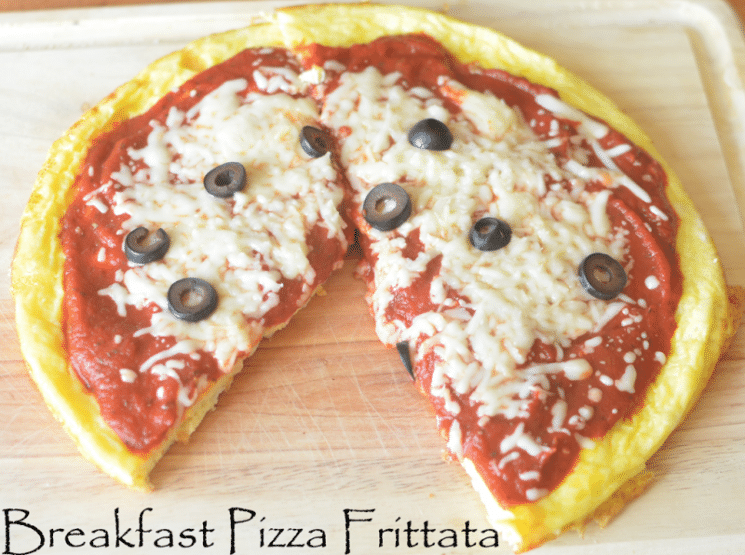 Make a frittata shaped like a pizza and add spaghetti sauce and veggies. 14. Make a veggie and potato hash (sweet potato + kale or asparagus + potato). 15. Make mini frittatas with spinach and sun-dried tomatoes. 16. Make a carrot-mango smoothie. 17. Mix spinach into savory oatmeal. 18. Make a sweet potato spread for toast. 19. 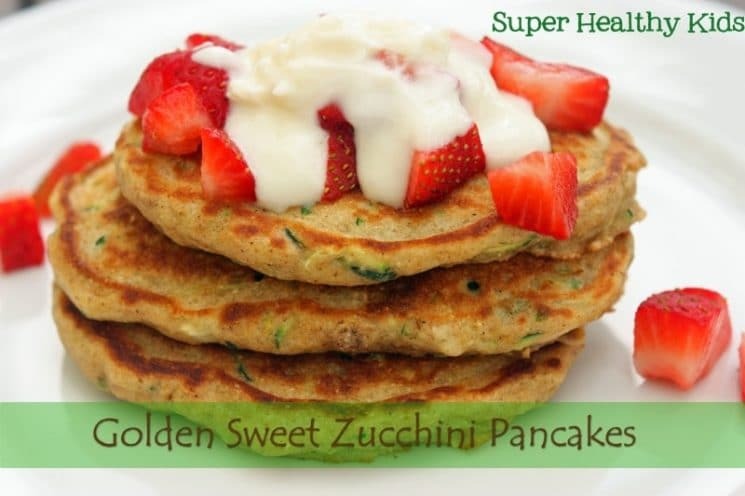 Zucchini pancakes or muffins. 20. Spread pumpkin butter on toast. 21. Go raw! Serve a plate of fresh cut vegetables alongside the main course. 22. 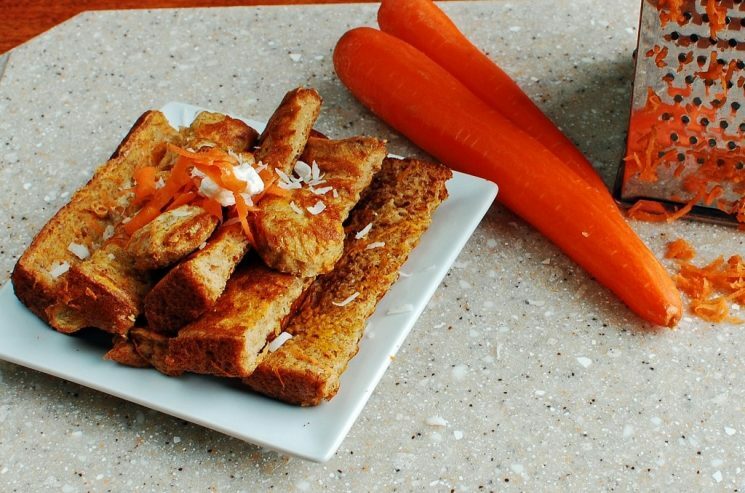 Incorporate shredded vegetables into french toast and pancakes. (carrots and orange veggies are especially good for this). 23. Make your own vegetable juice with a juicer. 24. Whip up a green smoothie. 25. 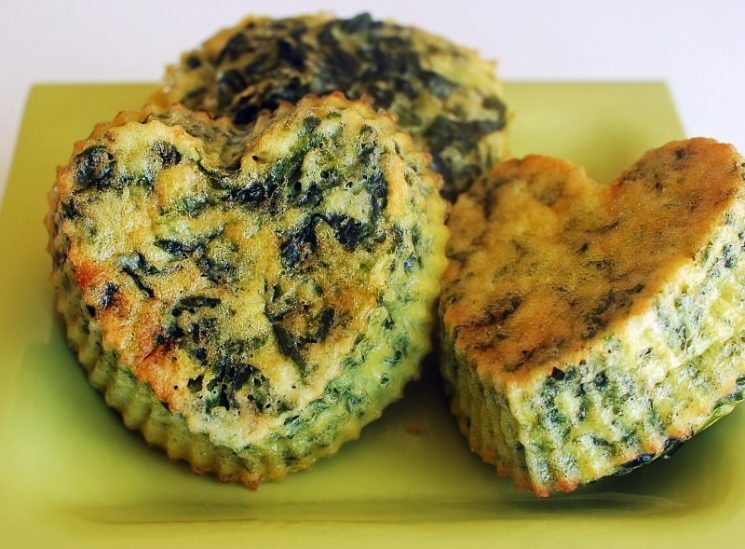 Sneak vegetable puree into muffins, pancakes and breads. 26. Make a quinoa, veggie, and egg white scramble. 27. Make a crustless quiche and add broccoli. 28. 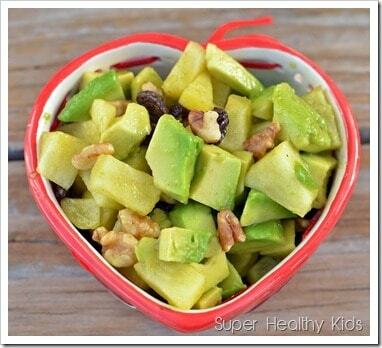 Make a breakfast salad. 29. Add diced bell peppers, scrambled eggs and salsa to a tortilla and wrap it up. 30. Layer a tortilla with avocado and Canadian bacon slices then top with fresh spinach. 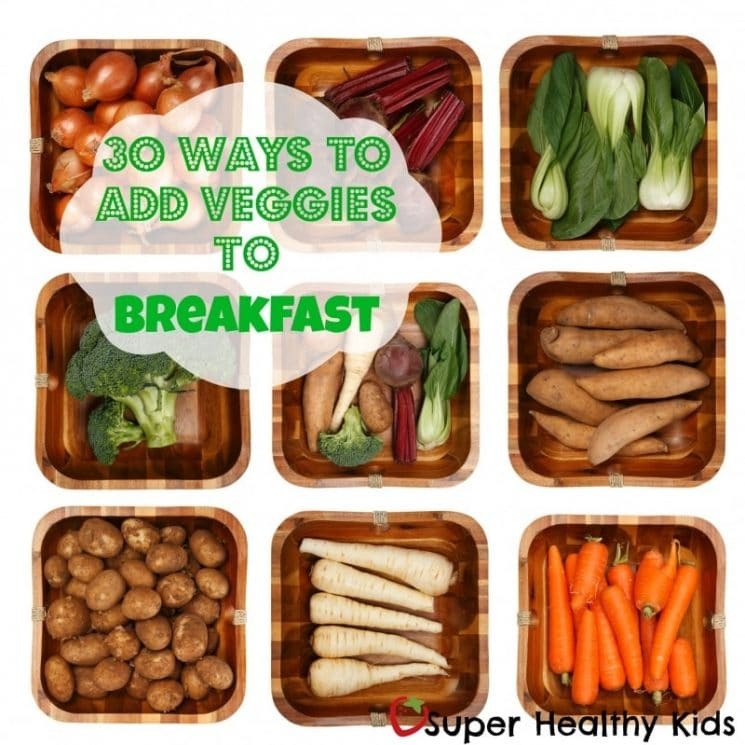 What are some of your favorite ways to include veggies with breakfast? I freeze whole organic kale leaves in gallon baggies. When frozen, they become brittle and will crush into dust, which I then sprinkle in everything–eggs, chili, salads, etc. Yum! I am definitely more a savoury than sweet girl (haha – we could interpret that in many ways), and my favourite breakfast is home made chilli beans, which are made by sauteeing onion, garlic and carrot (finely chopped), then adding beans (canned is fine, although not ideal, only plain and look at the label, they should only contain beans, water and maybe a bit of seasalt; a lot of them have an unidentified preservative added), when in season i also add a chopped capsicum. I then add salt, chilli flakes, smoked or plain paprika, cumin, ground coriander seeds and a little pinch of cinnamon. Then add some tomato puree or paste, and stir. Make sure you dont leave this dish alone for too long as beans have a tendency to stick. Serve this with tomato salsa on toast with an egg, when tomatoes are in season. Otherwise top up with loads of freshly chopped coriander, parsley or mint or sprinkle and drizzle with quick dressing made of Greek yoghurt, mustard, lemon juice, extra virgin olive oil and voila. To guild the lily, i like a sprinkle of chopped toasted almonds on top. That’s my ultimate breakfast, but it can be quickly turned into lunch or dinner by making creamy polenta instead of toast and a helping of seasonal greens.